Club Tyrone is hoping their Spires Art glass wands will spread some magic to its Acadamh Thír Eoghain (Tyrone Academy) initiative after the first 50 Tyrone Dragons where presented with their specially commissioned hand-crafted glass wand. Among the first to be recognised for their contribution towards the future development of youth football in the county are Terry McNally, Theo McLaughlin , Roisin Dooher, Dermot McCartan and Colin McMenamin. 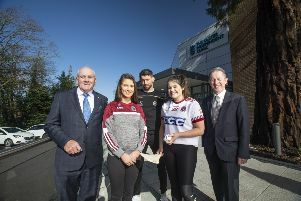 Acadamh Thir Eoghain will develop young people in Tyrone as Gaelic players on a ‘skills, not drills’ philosophy and will operate at four levels; Under 15, 16, 17 and 20 replacing the former development squad set-up. Academy Tyrone will now become the new process for nurturing Tyrone GAA talent.